Will Australia's Encryption Law Kill Privacy in Name of Safety? From therapy to entertainment, to the technological singularity — a recent hire to the School for the Future of Innovation in Society opens a window into the endless possibilities, dangers and uncertainty of brain implants at ASU’s TEDx event. “I'm looking at how they are presently being used and why they are being used,” Michael said. “For example, a person suffering from Parkinson's disease, Tourette syndrome, or dystonia — when they become resistant to drugs and pharmaceuticals — will opt for this procedure as a last resort because it’s the only hope they have of having some quality of life." 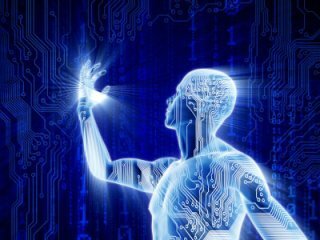 Michael will also explore a future where implants are used beyond therapeutics for entertainment, and eventually, the possibility of uploading our own consciousness to technology. Fewer than 200 people watched the original live video of the Christchurch massacre, Facebook has said. None of them reported it immediately to Facebook during the attack, and it took half an hour after the killer started his live video for anyone to report it using Facebook's reporting tools, the company said. However, this has been challenged. Jared Holt, a reporter for Right Wing Watch, said he was alerted to the livestream and reported it during the attack. Police carry flowers left by well wishers to the Al Noor Mosque in Christchurch. Fifty people died in the shootings on Friday. "I was sent a link to the 8chan post by someone who was scared shortly after it was posted. I followed the Facebook link shared in the post. It was mid-attack and it was horrifying. I reported it," Holt tweeted. "Either Facebook is lying or their system wasn't functioning properly." Holt then checked and could find no record of his report on Facebook's internal tool for listing the reports users send off. "I definitely remember reporting this but there's no record of it in Facebook. It's very frustrating," Holt told Business Insider. "I don't know that I believe Facebook would lie about this, especially given the fact law enforcement is likely asking them for info, but I'm so confused as to why the system appears not to have processed my flag." Facebook declined to comment when contacted by Business Insider. Facebook vice president Chris Sonderby said the social media giant is working around the clock to prevent the video from being shared again. "The video was viewed fewer than 200 times during the live broadcast. No users reported the video during the live broadcast," Sonderby said in a statement. "Including the views during the live broadcast, the video was viewed about 4000 times in total before being removed from Facebook. "The first user report on the original video came in 29 minutes after the video started, and 12 minutes after the live broadcast ended." The link to the live-stream was posted on anonymous message board 8chan, and shortly after the 17-minute video ended, a download link for it was also posted on the site. Facebook removed the video and "hashed" it to automatically prevent it being uploaded again, but some users added watermarks or edited the video in order to slip it past the detection algorithms. In the first 24 hours after the shooting, Facebook removed about 1.5 million versions of the attack video. "More than 1.2 million of those videos were blocked at upload, and were therefore prevented from being seen on our services," Sonderby said. "We have been working directly with the New Zealand Police to respond to the attack and support their investigation." Prime Minister Jacinda Ardern has spoken to Facebook chief operating officer Sheryl Sandberg since the attack. The Government's Cabinet meeting on Monday is expected to be mostly focused on gun law but it is understood the Government is also keen to call on social networks to do more to fight radicalisation in the wake of the mosque shootings. This could include a call to share more data directly with intelligence agencies. The Global Internet Forum to Counter Terrorism - a consortium of global technology firms including Facebook, Google and Twitter - said it shared the digital "fingerprints" of more than 800 edited versions of the video. Neal Mohan, YouTube's chief product officer, told The Washington Postthat his platform also struggled to moderate the video successfully on its platform. His team finally took unprecedented steps - including temporarily disabling several search functions and cutting off human review features to speed the removal of videos flagged by automated systems. Many of the new clips were altered in ways that outsmarted the company's detection systems, he said. Despite such efforts, concerns have been raised by a professor of engineering and information sciences about social media's failure to implement preventative measures. Professor Katina Michael of the University of Wollongong said algorithms can only do so much to prevent certain content being uploaded and human moderators are already forced to wade through screes of questionable content. "The best algorithms couldn't have stopped this. Having said that, if you [Facebook] can't stop it, don't offer it. If you want to provide the service, perhaps you have to vet the users." Michael said the current algorithms were set up based on a corporate model that was centred around generating revenue, not looking for controversial content. "It is the failure of not only the algorithms, but human moderators." Australian prime minister Scott Morrison has asked G20 members to consider practical ways to force companies like Facebook and Google to stop broadcasting atrocities and violent crimes. Sonderby said Facebook is committed to working with leaders in New Zealand and other governments to help counter hate speech and the threat of terrorism. Meanwhile, police probing the online presence of the terror suspect and his involvement in far-right chat boards and other internet activity have met with some resistance. In one email exchange, New Zealand police requested an American-based website preserve the emails and IP addresses linked to a number of posts about the attack, but were met with an expletive-filled reply. Disclaimer: The way I was quoted seems to imply that the content moderators at Facebook were partially to blame. This is not what I said in the interview with Matthew. Moderators are not paid to catch this kind of content; they are paid to investigate copyright and controversial content. Humans are at the mercy of the machine on this occasion. It can be likened to 100 people trying to stop leaks in 200,000 buckets. It just cannot happen. In terms of what could have stopped this footage from spreading? Ensuring more predictive AI algorithms, and also total information surveillance of everything coming through servers, and still that is not foolproof. Katina Michael with Linsday McDougall, March 19, 2019, “Facebook Livestreaming and the NZ Massacre: A question of corporate responsibility”, ABC Illawarra Radio: Drive, https://radioinfo.com.au/news/lindsay-doctor-mcdougall-loves-illawarra-hosts-new-abc-drive-program. Thanks also to ABC Producers Rory McDonald and Jake Cupitt. © 2019 News Limited. All rights reserved. Commuters are willing to use facial recognition technology that charge them each time they get on and off their mode of transport. The technology has already become part of everyday life in China — in some cities it is used to verify commuters’ identities through camera technology installed at train stations. Visa’s and Stanford University’s new Future of Transportation: Mobility in the age of the Megacity report, quizzed more than 20,000 people in 19 countries including Australia and found 54 per cent of Australians would be willing to try facial recognition or bluetooth technology when commuting. Visa’s head of product for Australia, New Zealand and the South Pacific Axel Boye-Moller said while this type of technology is yet to be used by Australian commuters this could change. “We have rolled it (biometric) out through tap and pay and using your mobile, biometrical authentication is an important part of that customer experience,” he said. Mr Boye-Moller said this would allow commuters to do away with using a transport or bank card to pay for their commute. Instead customers could rely on facial recognition to pay by linking it up to an app that contains their bank information. Transport NSW has already gone live on ferries, light rail and trains allowing customers to tap and pay with their bank card and/or compatible smartphone or smartwatch when they get on and off transport. And in Melbourne similar technology is still in the trial phase for commuters using trains, buses and trams. 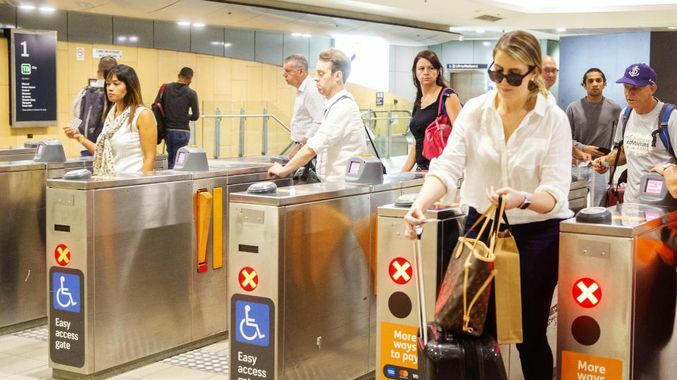 University of Wollongong professor Katina Michael, an expert in biometrics, said commuters would be open to using biometrics to pay because “they think they are being monitored anyway”. “We’ve got cameras everywhere and if they are going to be adopted to connect with people’s facial images then people will become complacent,” she said. The report also showed Australians’ reliance on using their own vehicle is the highest in the world — 72 per cent use this mode of transport to get to and from work each day. It also showed 64 per cent would be willing to pay with a debit or credit card for all modes of public transport. Citation: Sophie Elsworth, “Travellers want to try facial recognition technology to pay”, The Cairns Post (Sun Herald), 27 February 2019. I cast doubt on the survey findings of the University of Stanford study. As I suspected it was an online survey, confirmed by the reporter. Over 50% of commuters were willing to use their biometric to pay for transportation costs in 19 countries? Online surveys attract individuals using very small incentives for surveys they fill out. These are people who are already ‘in sync’ with the gig economy. Postal surveys would yield different results because you are asking a different kind of demographic what they think. I described consumer responses toward biometrics as a complacency to the number of surveillance cameras that are currently tracking people. Have individuals lost faith in privacy? So many government agencies now demand a passport-like, drivers license-like facial image registration, that people are likely sick of enrolling into such systems. The Capability has changed everything as the government amasses all photographic ID into the one big system. The fact that in Australia, soon it will not be illegal to drive without a card token for a drivers license, has opened the flood gates to other services being utilised with unique biometrics. I identified major problems with false positives and false negatives. Revenues lost, mistakes with computers being “blocked out of travel”, and also the issue of identical twins who could rort the system. I had the great pleasure of being interviewed today by Ms Anja Taylor in Los Angeles today. Anja works for Wildbear Entertainment that does co-productions with all the major television channels in Australia. She was formerly a researcher and presenter on Catalyst. This interview will form a part of the documentary series: “Searching for the Super Human” that will air on ABC in Australia later this year. Brief discussion about the internet of things and the emergence of big data. What effect / impact this is having on society. You have mentioned “ambient intelligence” in your articles - what is it? What are “insertable chips” and what is their brief history? What types of new insertable chips are starting to emerge? Recently we have seen trials for insertable chips which can be used to open doors or pay for public transport, the trials found largely that people found them useful and painless – do you have concerns with these? What smart chips are you most concerned with? We are already being tracked with our smartphones – is this different? Our pets are now chipped as a matter of course – do you see this happening with humans? What are the implications? Can we not just opt out? Can it be done responsibly? A special thank you to Luke for filming. Government leaders & law enforcement are trying to force tech companies to put backdoors in encryption in the name of public safety. There are 750,000 law enforcement employees & 1/2 million US intelligence agencies community employees who may use those backdoors, & likely many others worldwide. Strong encryption is available throughout the world. If businesses & general public are forced to use encryption with back doors, will cybercrooks will be the only ones using strong encryption; those the backdoors were intended to be used on to begin with? How will Australia’s new law requiring encryption backdoors impact data security & privacy? Who has oversight of that law? How will it impact other countries? Does any evidence prove encryption backdoors have improved safety/security? Rebecca discusses these and related issues with Dr. Katina Michael, Arizona State University director of the Centre for Engineering, Policy and Society. Katina is also a privacy and uberveillance pioneer. 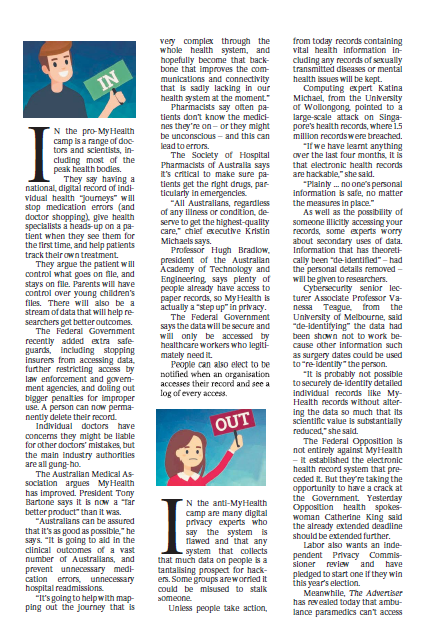 As the Federal Government today pushes the button to create My Health Records for every Australian who wants one, the industry has stepped out asking for more transparency around security and secondary use of the records to enable people to make more informed decisions about it. The industry has also voiced out about data de- and re-identification, a global approach to cybersecurity issues as healthcare digitises, information security requirements of the future and blockchain as a way to alleviate some of the challenges associated with the My Health Record system. On 26 November 2018, the Federal Parliament passed legislation to strengthen privacy protections in My Health Records Act 2012 without debate or division. The new legislation means that Australians can opt in or opt out of My Health Record at any time in their lives. Records will be created for every Australian who wants one after 31 January and after then, they have a choice to delete their record permanently at any time. The date of 31 January follows much deliberation from the Federal Government to extend the opt-out date. Australians initially had until 15 October 2018 to opt out of the national health database, or a My Health Record was to be created for them by the end of that year. But following the opposition calling for an extension to the opt-out period, the public outcry against the potential for the data to be shared with police and other government agencies, a leaked government document detailing the Australian Digital Health Agency’s response to concerns and a raft of changes recommended by the Senate Inquiry into My Health Record, the Federal Government pushed this date back and relaxed its stance on when Australians can opt in or opt out of the system. Australian Academy of Technology and Engineering (ATSE) President Professor Hugh Bradlow said the collection of health data across the population will result in better health outcomes as it not only shows how effective interventions are, but also allows treatments to be personalised based on the experience of thousands of other patients. “New forms of measurement (based on artificial intelligence) will also give patients far more significant information about institutional performance, practitioner performance, the outcomes of specific interventions, etc.” he said. The Society of Hospital Pharmacists of Australia (SHPA) Chief Executive Kristin Michaels said the My Health Record debate highlighted the need for an integrated ehealth system, accessible only to health professionals and set up at the request of health organisations, for the benefit of all Australians. "All Australians, regardless of any illness or condition, deserve to get the highest-quality care,” Michaels said. “More often than many would think, patients are unable to explain the medicines they are already taking and for what conditions they are already being treated, particularly after a seizure or if unconscious. Many of these patients are unaccompanied. Sometimes this lack of information leads to errors that have serious impacts on people’s lives. “[Hence] hospital pharmacists have long called for a shared, electronic patient data system that links up a fragmented health system and empowers patients in their own care." However, University of Melbourne Department of Computing and Information Systems Cybersecurity Senior Lecturer Associate Professor Vanessa Teague expressed her concerns around the privacy implications of secondary uses of My Health Records not being accurately explained. “Both doctors and patients can be easily and confidently identified in a dataset… In the case of patients, this means that a few points of information, such as the patient's age and dates of surgeries or childbirths, is enough to identify the person and thus, retrieve all their Medicare bills and PBS [Pharmaceutical Benefits Scheme] prescriptions for many years. Teague said patients may choose to opt out of secondary uses of their data but are unable to make a “genuinely informed decision” if they are inaccurately told that their detailed record cannot be identified. “Even more importantly, those whose identifiable MBS [Medicare Benefits Schedule]-PBS records were already published in 2016 should be notified, because the earlier release could make re-identification of their My Health Records much easier,” she said. Harvard Medical School International Healthcare Innovation Professor Dr John Halamka also previously criticised the system for relying on outdated technology, saying that the $2 billion My Health Record was nothing more than “digitised paper” as it uses such “out-of-date” technology that crucial patient information on test results and diseases are unable to be read or shared by computers. University of Wollongong School of Computing and Information Technology Professor Katina Michael said health data breaches, for some, could have a huge impact. She used the recent example from Singapore, where 1.5 million Singapore health records were breached in a highly targeted effort on SingHealth. Among the breached health records was Singapore Prime Minister Lee Hsien Loong's personal records. “What does this tell us when one of the world's most advanced cybersecurity nations suffers such a large-scale attack? Plainly, that no one's personal information is safe, no matter the measures in place,” she said. Michael also speculated that there is the possibility of a ramp up of blockchain initiatives to beef up on My Health Record security. “We will likely be told in the not too distant future that we wildly underestimated our security requirements and as such, must go one step further and protect our credentials,” she said. According to Professor Michael, this involves the implant of a 16-digit Personal Health Record (PHR) ID number into people that also reads vital signs while embedded. This technology then alerts first responders of ailments and medications without the need for the person to provide any information. ATSE’s Bradlow said the industry needs to be “realistic” about it as the danger of data leaking due to cyber hacking is as true as hacking any other data system. “Let’s remember that many [healthcare professionals] have easy access to today’s paper-based health records – an electronic record is actually a step up in privacy. Within My Health Record, we can make it the default to require a patient access code,” he said. “A well-designed record system which is managed by a professional security organisation and has a clear audit trail, for example, provided by blockchain, can mitigate this risk significantly." Today is the final day to opt out of the controversial My Health Record. So should you? Here are the major arguments for and against the national medical database. In the pro-MyHealth camp is a range of doctors and scientists, including most of the peak health bodies. They say having a national, digital record of individual health “journeys” will stop medication errors (and doctor shopping), give health specialists a heads-up on a patient when they see them for the first time, and help patients track their own treatment. They argue the patient will control what goes on file, and stays on file. Parents will have control over young children’s files. There will also be a stream of data that will help researchers get better outcomes. The Federal Government recently added extra safeguards, including stopping insurers from accessing data, further restricting access by law enforcement and government agencies, and doling out bigger penalties for improper use. A person can now permanently delete their record. Individual doctors have concerns they might be liable for other doctors’ mistakes, but the main industry authorities are all gung-ho. The Australian Medical Association argues MyHealth has improved. President Tony Bartone says it is now a “far better product” than it was. “Australians can be assured that it’s as good as possible,” he says. “It is going to aid in the clinical outcomes of a vast number of Australians, and prevent unnecessary medication errors, unnecessary hospital readmissions. Pharmacists say often patients don’t know the medicines they’re on – or they might be unconscious – and this can lead to errors. The Society of Hospital Pharmacists of Australia says it’s critical to make sure patients get the right drugs, particularly in emergencies. “All Australians, regardless of any illness or condition, deserve to get the highest-quality care,” chief executive Kristin Michaels says. Professor Hugh Bradlow, president of the Australian Academy of Technology and Engineering, says plenty of people already have access to paper records, so MyHealth is actually a “step up” in privacy. The Federal Government says the data will be secure and will only be accessed by healthcare workers who legitimately need it. People can also elect to be notified when an organisation accesses their record and see a log of every access. In the anti-MyHealth camp are many digital privacy experts who say the system is flawed and that any system that collects that much data on people is a tantalising prospect for hackers. Some groups are worried it could be misused to stalk someone. Unless people take action, from today records containing vital health information including any records of sexually transmitted diseases or mental health issues will be kept. Computing expert Katina Michael, from the University of Wollongong, pointed to a large-scale attack on Singapore’s health records, where 1.5 million records were breached. “If we have learnt anything over the last four months, it is that electronic health records are hackable,” she said. As well as the possibility of someone illicitly accessing your records, some experts worry about secondary uses of data. Information that has theoretically been “de-identified” – had the personal details removed – will be given to researchers. Cybersecurity senior lecturer Associate Professor Vanessa Teague, from the University of Melbourne, said “de-identifying” the data had been shown not to work because other information such as surgery dates could be used to “re-identify” the person. “It is probably not possible to securely de-identify detailed individual records like MyHealth records without altering the data so much that its scientific value is substantially reduced,” she said. The Federal Opposition is not entirely against MyHealth – it established the electronic health record system that preceded it. But they’re taking the opportunity to have a crack at the Government. Yesterday Opposition health spokeswoman Catherine King said the already extended deadline should be extended further. Labor also wants an independent Privacy Commissioner review and have pledged to start one if they win this year’s election. Meanwhile, The Advertiser has revealed today that ambulance paramedics can’t access the record – and they’re the people most likely to need to know if you have a pre-existing issue or deadly allergy. The Australian Digital Health Agency, which runs MyHealth, says that access has not been activated yet. On top of that, there are complaints that bad IT setups in public hospitals mean doctors in emergency departments can’t access the records anyway. In the end – as Health Minister Greg Hunt said yesterday – “it’s every Australian’s choice”. Over 33 million instances of reach were recorded by the Australian Science Media Centre campaign for more information related to eHealth. The Human Rights Commission has raised serious concerns about significant threats to human rights with the Federal Government's new encryption laws. A last-minute deal between Labor and the Coalition saw the laws pass late yesterday. But there are now calls for critical amendments to be made as soon as possible. Stories about the Assistance and Access Amendments to the Telecommunications laws in Australia were syndicated across ABC regions using one of two stories I recorded- the first with ABC Illawarra, and the second with ABC’s The World Today. Here was a record of syndication until about 11am this morning, December 7 2018. This passing of the Bill by Australian Parliament has many alarmed. How could this law have been passed in the last “sitting” week of Parliament? 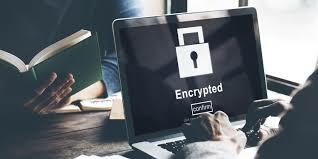 A University of Wollongong data expert has labeled the government's proposed encryption laws delusional and warns they could have catastrophic consequences. The changes would force technology companies to help police access encrypted messages. Professor Katina Michael, from the School of Computing and Information Technology says the powers are unprecedented and have no oversight. She is speaking to ABC reporter Kelly Fuller. British companies are planning to implant staff with microchips to improve security. Sputnik spoke about it to Katina Michael, professor of the Faculty of Engineering and Information Sciences at the University of Wollongong. Sputnik: Could companies sell employees' personal data to third parties? Katina Michael: The first thing to know is that before an employer considers selling implant discrete data to a third party, they would likely use it to monitor their staff. For example, for physical access control, the way staff congregate to exchange ideas, how often they use the restroom, how fast they may be finishing and completing some tasks. It is not to say that that would occur, but quite possibly it would be used as a timestamp device. In comparison, today we commonly find facial recognition or fingerprint recognition allows employees to log their time at work. But a company now can use this technology to introspectively look at what employees are doing. I mean, we can consider employers today gathering data on their employees by using smartphones: I know a lot of companies sign off an agreement when they do offer their employees a company-sponsored smartphone, identifying that they may well log their locations and time based on the company smartphone. Otherwise, I don't believe that a corporation would sell that information. Sputnik: But if companies were to sell personal data to third parties, what could employees do to prevent that from happening? Katina Michael: Employees would not be able to block the distribution of data gathered from their implantable devices, unless they've signed some legal agreement not allowing consent to occur or through local workplace surveillance laws. And so they can block the corporation from sharing that information with other companies, such as health insurance providers. Sputnik: Could employers know if staff contacted a competitor about a job? Katina Michael: You have to consider that the diffusion of the implants is only a couple hundred people, for example, in the UK, and many of them are not in the employment context. In one case there was an implant device granted to someone with a systematic technology need, an amputee; and when we look at these more widely in the world we could say that probably a few thousand people at most, who are hobbyists to get an implant because they are infused by technology and progress, and being able to automate certain aspects of their life. I don't believe that, for the time being, information would be provided when one implantee meets another implantee, because of the limitations of the mutual communication and the radio frequency identification being used in that technology. These technologies don't act like smartphones; for the time being the devices are proximity devices that require you to be no more than ten centimeters away from a reader. Identifying cyber-trolls can be a difficult task. They come in all shapes and sizes, with real names or pseudonyms, may be young or old, male or female, admins, moderators, or everyday people who post online. Sometimes trolling can be obvious, other times covert, at times happen through sheer ignorance and still at other times be deliberate. Online communities create rules to be followed, so that those posting can conform to some standard, allowing for a community to flourish. But what happens when the interpretation of those rules are misconstrued or taken is a means to an end? One of the key attributes to open online communities, is that all people are welcome to observe, contribute, consider and reply, to ongoing commentary as they see fit, so long as they are in coherence with the theme of the venue. We all know what spam is. Spam posted detracts from the main issues of an online community. Moderators can choose to remove those individuals who are spamming the ether, taking away from the main cause(s) of their community. But what happens when an innocent contributor is blocked or removed from participating because they have seemingly broken the rules. In this case someone likely using their official company identity, posted more than one post per week, despite that the theme of the posts was photography, bringing more attention to the online community at hand. Business have been known to use soft selling techniques to create networks of value for the goods and services they sell. However, in this instance, it seems the administrator(s) acted harshly in their interpretation of the rules of the online community. Possibly wrongly, given other members of the community spoke up. Power to the people, obviously, in this instance. But what happens in bigger online community venues like Wikipedia? Is Wikipedia and its administrators free of creating a history unto themselves? Who can speak up after a deletion of content, or indeed a deletion of a person known to the community? The power is indeed with the administrators and moderators, not with the general online community. Disinformation is a difficult issue to face at hand. That is because more than 98% of the content may be factual, or at least contain "most of the truth". The style of writing may also seem impartial but in fact is weighted to support a view that is not "centrist". We need to re-evaluate online communities in terms of these very tricky parameters, that are not straightforward. The role of administrator, moderator and community participant are not equal, although the voice of each can be heard online, if enough people care to take up the point in question. Citation: Katina Michael and Kendall Hutt, October 29, 2018, “When Members of an Online Community Challenge Admin and Moderators”, stuff.co. It was a sunny day in December 2015 and 14 people lay dead in San Bernardino, California after a mass shooting at the North Park Elementary School. I still remember the news footage taken from a helicopter hovering over a bullet-ridden black Ford Expedition, in which the perpetrators Syed Rizwan Farook and Tashfeen Malik had fled and were killed in, during a shootout with police. There have been so many mass shootings in America since, including last year’s horrific killing of 58 concertgoers in Las Vegas, that the grim memory of San Bernardino has faded. But the tragedy has had a lasting legacy in unexpected ways. In the months after the shootings, the FBI attempted to enlist the support of phone-maker Apple to gain access to Syed Rizwan Farook’s iPhone 5C as part of their investigation into what was being labeled a terrorist attack. The FBI wanted Apple to create a new operating system they could install on the dead shooter’s phone that would bypass security features. It would also serve to give the FBI access to iPhones in future criminal investigations too. Apple famously refused, telling the FBI that giving in to a demand to “hack our own users” would set a precedent undermining the privacy of all iPhone users. “While we believe the FBI’s intentions are good, it would be wrong for the government to force us to build a backdoor into our products. And ultimately, we fear that this demand would undermine the very freedoms and liberty our government is meant to protect,” he wrote in an open letter to customers at the time. This was just a couple of years after the Edward Snowden leaks, which revealed the extent to which government security agencies were secretly gathering masses of internet data. The big tech companies, keen to shore up trust, rushed to introduce end-to-end encryption to services like WhatsApp, Gmail and iMessage, making the argument that if their customers’ data was invisible to them, they couldn’t hand it over to the authorities. There were tense meetings between then-president Barack Obama and Apple chief executive Tim Cook, who didn’t resile from his position. Eventually, the FBI found a company that could break the phone’s encryption, paying them nearly US$1 million to do so. The issue died down as a technical fix broke the impasse. But politicians have continued to push the issue calling for new legislation that would force tech companies to allow law enforcement agencies access to encrypted systems. In the wake of the San Bernardino massacre, President Trump made his feelings on the issue plain, calling for a boycott of Apple products. “Who do they think they are?" He complained to the hosts of Fox & Friends. Since then, he has been relatively silent on encryption, but his officials and US senators have been quietly working on the issue with a view to drafting encryption circumvention legislation that they know will face stiff resistance from the tech sector and its K Street lobbyists in Washington D.C. Governments elsewhere have the same goal in mind as they struggle to track the online communication of suspected criminals and terrorists. An attack in London last May that saw a man drive his car into pedestrians, killing four people, opened the encryption debate in Britain. The killer had apparently sent a message on the encrypted WhatsApp platform hinting at what he was about to do, moments before he ploughed into unsuspecting pedestrians. It led Theresa May to call for her security services to be given the ability to circumvent encryption systems. The UK’s Investigatory Powers Act or ‘Snooper’s Charter’ introduced in 2016 gives British law enforcement agencies some powers to require network operators to remove “electronic protection” from communications and data. But it isn’t seen as strong enough to demand backdoors to encryption services, particularly for services delivered from outside the UK. New Zealand introduced similar legislation in 2013, with the Telecommunications (Interception Capability and Security) Act. That requires internet providers to make their networks interception available to government agencies armed with a warrant. But it only applies to “network operators” - it is unlikely that the law could be used to demand Apple or Microsoft retrieve encrypted data for the New Zealand Police or the GCSB. The issue hasn’t flared up in New Zealand in recent years, but our membership of the ‘Five Eyes’ security partnership with Australia, the United Kingdom, the US and Canada could propel us towards the legal changes other countries are pursuing. Meeting earlier this year, the Five Eyes issued a joint statement stating their preference for technology service providers to “voluntarily establish lawful access solutions to their products and services that they create or operate in our countries”. Across the Tasman, the Liberal Government is pushing ahead with mandatory measures. The so-called Assistance and Access Bill proposes three levels of assistance that tech companies and internet providers could be required to lend law enforcement agencies. At the lowest level, voluntary assistance could be offered, with the highest level of assistance seeing the country’s attorney general requiring tech companies to “build a new capability” into their systems to allow access to encrypted information. The Bill has been slammed by Apple and other multinational tech companies as being too ambiguous and wide-ranging as well as by privacy and encryption experts. “This is not a solution to the problem of just-in-time policing and border force security but an override on the freedoms of everyday Australians and Australian companies, or even those doing business in Australia,” says Professor Katina Michael, a technology and innovation expert at the University of Wollongong and Arizona State University. Apple reiterated its call that breaking encryption systems will undermine security for everyone. “This is no time to weaken encryption,” it wrote in a submission on the Bill. The Australian Computer Society saw no reason to expedite the legislation which it described as “problematic”. But Dr Richard Adams, Adjunct Fellow in the School of Information Systems at Curtin University, said that while tech companies had an obligation to protect their customers’ data, they also had obligations to the “wider community”. “The challenge is for manufacturers to meet the needs of both groups rather than adopt the best stance from a marketing/cost perspective,” he says. With that in mind and the legislation putting the onus on the tech companies to come up with ways to grant security services access to encrypted services, it was time to consider what technical solutions could be offered to meet the government half-way. “A simplistic solution on phone devices would be to store the data twice, once with the ‘user key’ and once with the ‘manufacturer key’ so the strength of the encryption itself would not be affected and the risk of having two ‘keys’ could be mitigated by the use of a very complex manufacturer key requiring physical access to the device,” he says. “Obviously there would be push-back on the additional storage required and reduced battery life but the point is that from a purely technical standpoint it could be done relatively easily." With the Five Eyes member countries all at different stages in pushing for stronger laws to deal with encrypted services, such technical efforts to assist governments will need more serious consideration. The alternative is heavy-handed legislation that is not fit for purpose, rammed through by governments with a larger law enforcement agenda. But Michael says we also need to consider the threat to privacy posed by the companies that are opposing efforts to circumvent encryption, which are wielding immense power themselves through their access to masses of our data. “The complexity here is in the fact that private corporations like Apple, Google, Facebook, Amazon and Microsoft are amassing so much personal data that citizen data rights are being equally eroded by corporations themselves who share the data with third parties,” she says.